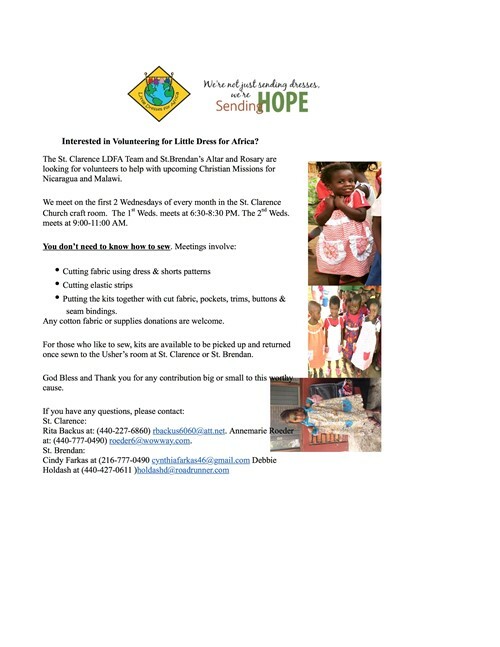 The St. Clarence LDFA Team and St. Brendan’s Altar and Rosary are looking for volunteers to help with upcoming Christian Missions. We meet on the first 2 Wednesdays of every month in the St. Clarence Church craft room. The 1st Weds. meets at 6:30-8:30 PM. The 2nd Weds. meets at 9:00-11:00 AM. You don’t need to know how to sew. Meetings involve cutting and putting kits together..
Any cotton fabric or supplies donations are welcome. For those who like to sew, kits are available to be picked up and returned once sewn to the Usher’s room at St. Clarence or St. Brendan. God Bless and Thank you for any contribution big or small to this worthy cause.